If you want to throw a backyard barbecue once in a while, then a gas grill is what you need. Gas grills can cost a lot depending on the size. But if you are looking for a product for home use, then you can find a good gas grill for an affordable price under $200. Let’s face it, not everyone wants a full-sized grill that has to stay in your backyard. Sometimes, you need something that is more compact so that you can take around with you. Well, if this is what you are looking for, then the Weber grill is just what you need. The smaller dimensions mean that this can be easily transported. Despite this, there is plenty of grilling space – with up to 189 square inches for you to cook your food on. It is also incredibly well-built and has a cast aluminum lid and body as well as porcelain-enameled cast-iron cooking grates. On the one hand, this does make the grill rather durable but all of these heavy-duty materials do come at a cost. You should be warned that it can be quite heavy so that it may be difficult to manage by yourself. As for the actual grilling features on this grill, there is plenty for you to enjoy. To start with, the burner produces 8500 BTU per hour and you can quickly grill anything that you want. Also, the push to start button makes this an easy grill for anyone to manage. To add to this, there is also an infinite control burner valve that makes adjustments incredibly simple. This is a great small type of grill for home use. It’s not powerful as the Char-Griller mentioned above, but it should suit the needs of a small family. 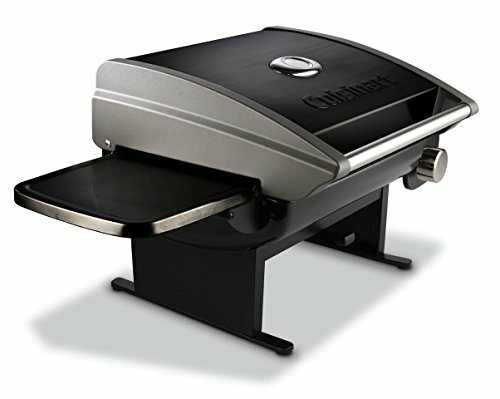 This grill has two burners with a heat input of 26,500 BTU. The cooking surface of 280 square inches is quite generous enough. The wire grates are porcelain coated, so there’s less chance of food getting stuck or blackened during cooking. The grill also comes with neat plastic side shelves and tool hooks that increase convenience. It also has a steel lid coated with porcelain that reduces rust and soot issues. The grill has a reliable Piezo ignition system too. 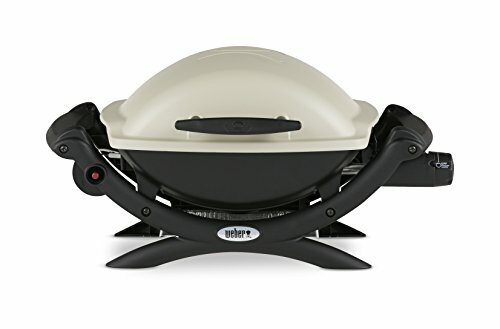 This grill is great for cooking veggies, eggs, pancakes, and similar foods. It’s great for cooking meats, but the process may take a bit longer. One major drawback of the unit is assembly. Everything comes disassembled, so the buyer has to put together the burner. That’s serious work involving over 130 bolts and screws. If you are not a tool person, it would be a nightmare. We highly recommend getting a professional to assemble the grill because if you get it wrong, the grill could be unsafe to use. This grill is rather small, but it makes up for it in portability. This grill only has 145 square inches of grilling area, but comes with a telescoping stand. The advantage of the stand is that it can be adjusted to the ideal cooking height. Though small, this grill can handle serving up to 6 people at a time. 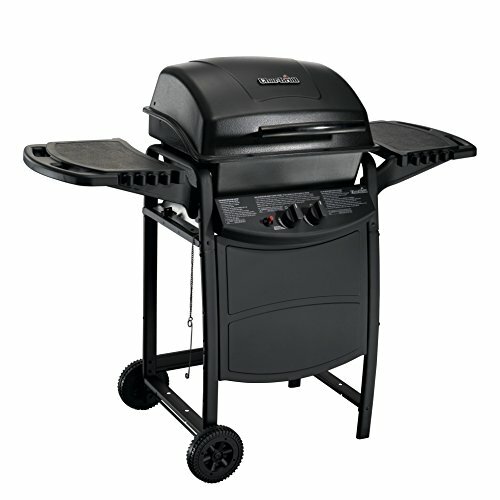 It only has 5,500 BTU heat input, so the grill cannot reach high temperatures like some products listed above. But if you want a small barbecue, this would more than suffice. 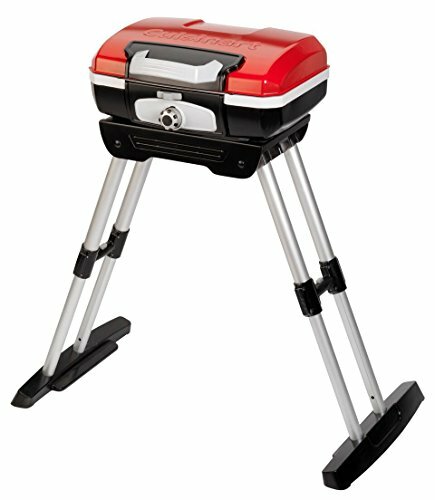 This grill is very lightweight at 17 pounds, and comes with lockable handle to carry the grill like a briefcase. 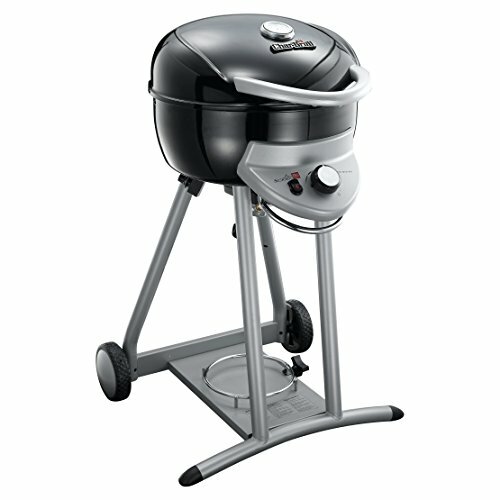 This grill is really easy to set up and then fold up for transportation or storage. The grill is small so you won’t be able to cook huge slabs of meat or big portions at once. The drip tray is also limited in capacity, and grease can start dripping down the ventilation holes if you are not careful. It will be good idea to remove the tray with each new portion. If you are a bit more of an experienced griller, then you need a grill that can match up with your skills. Well, luckily for you, this Cuisinart grill can do just that. This is largely to do with the fact that you have greater control over the heat. See, there are four burners and combined, they can give off up to 44,000 BTUs of heat. However, the heat control means that you can independently control the temperature off each of the cooking areas. This means that you can cook different foods at different temperatures, at the same time. The twist start ignition and the built-in thermometer make the grilling process even simpler. This is a grill that is perfect for either a large family or big cookouts thanks to its enormous cooking area. Here you get to enjoy 443 square inches of cooking space and a warming rack that is up to 167 square inches. The side prep tables also come in handy to store food or other ingredients while you are cooking. The grill is made from a solid stainless steel housing that ensures you can keep it outside without worrying that it is going to rust or get damaged. The only real issue with this grill is that due to its complexity, it can take a long time to assemble it together. The Char-Broil grill is a great option for those who have only a little bit of outdoor space to work with like a patio or a balcony. While this is a mid-sized grill, it is certainly not lacking in any features. For one thing, the grill has managed to maximize the amount of cooking space that you have. So, you can grill on 240 square inches of cooking area. There is also a secondary cooking area of 80 square inches if you want to keep some of the food separate. The other elements to enjoy on this grill are the electronic ignition as well as the gas control knob. You will find it incredibly simple to adjust and maintain the temperature at the perfect point. It should be noted that this grill is equipped with TRU-infrared technology. As a result, you will not have to endure flare ups or random hot and cold spots either. The towel bar on the grill also provides you with an excellent spot to hang utensils or anything else that you may need while you are cooking. The only issue with this grill is that its design makes it rather difficult to clean. So, you may find yourself frustrated trying to get rid of bits of food that have gotten stuck. Don’t buy a gas grill without a manufacturer’s warranty. The ideal gas grill will have a burner with a warranty for about a decade, or close. Make sure what type of LP canisters are needed to operate the grill. Some only support refill canisters, while other gas grills work with disposable canisters. It’s important to know which is best for the grill you have in mind. Porcelain coated grills are great for keeping food from blackening while cooking. However, porcelain cannot be brushed while hot to get food residue out. If the porcelain coat of a girdle is damaged, then it will distribute heat unevenly. If you plan on grilling mainly meats like steaks, then plan on buying a medium or large sized grill with temperatures that can rise above 400 degrees. Think about portability before you go purchasing any of the best gas grills under $200. Some medium sized gas grills are hard to carry and store.